Social media marketing is crucial for today’s business, but having too many networks to manage and posting to each of them at the best times can be time-consuming. Fortunately there are several online services that allow you to manage your social media from a single dashboard. 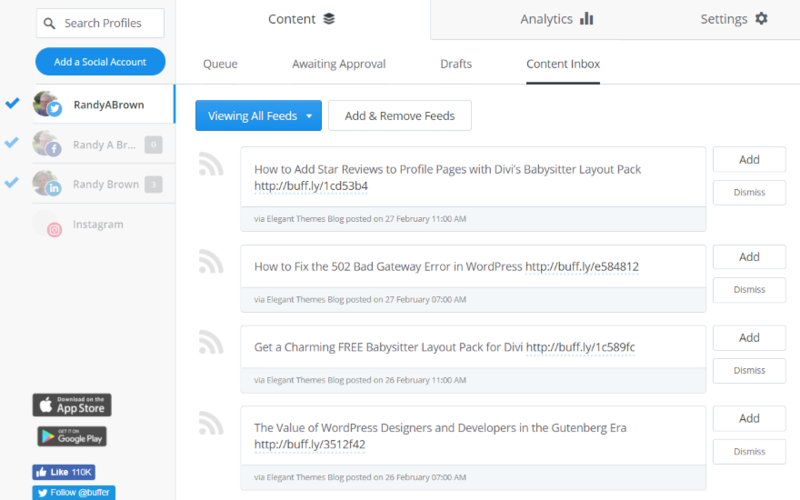 One of the most popular services is Buffer. 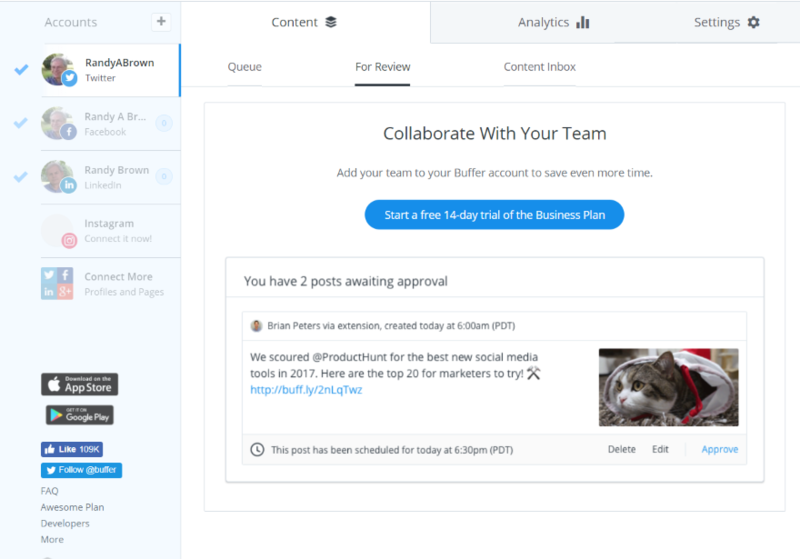 Buffer is a social media management app for web and mobile that simplifies your content strategy, allowing you to schedule your social media posts from a single location, and provides analytics to help you make decisions about your content. It has both free and premium options. In this article we’ll take a detailed look at Buffer, see its features, and look at a few ideal use cases. 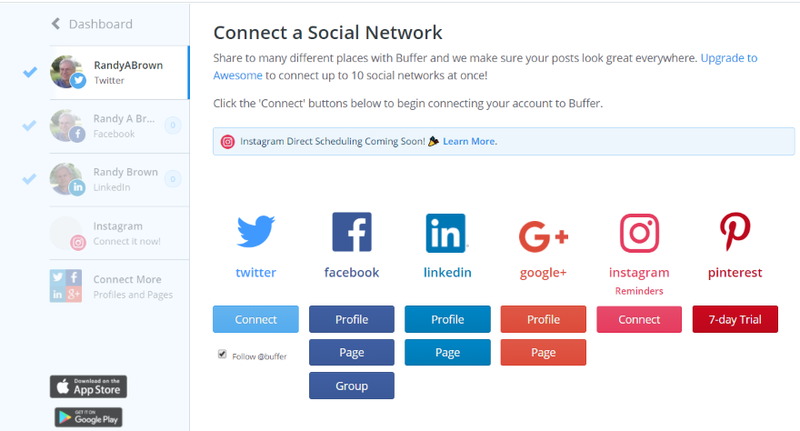 Buffer connects with 6 popular social networks and allows you to post to each of them simultaneously or individually, allowing you to manage your social media accounts in one place. Not having to log in to each account one at a time and post your content is a great time-saver. You can post immediately, add them to your Buffer to be posted at predetermined times, or schedule the posts manually. Select the date and time you want each post to go live or let Buffer handle the schedule for you. You can schedule for each account separately. Your posts are added to the queue and then posted according to your schedule or the default schedule. This means you can post according to the best times for your genre without having to be online at that time. You can even do this from mobile. Buffer provides analytics so you can track performance of each post. 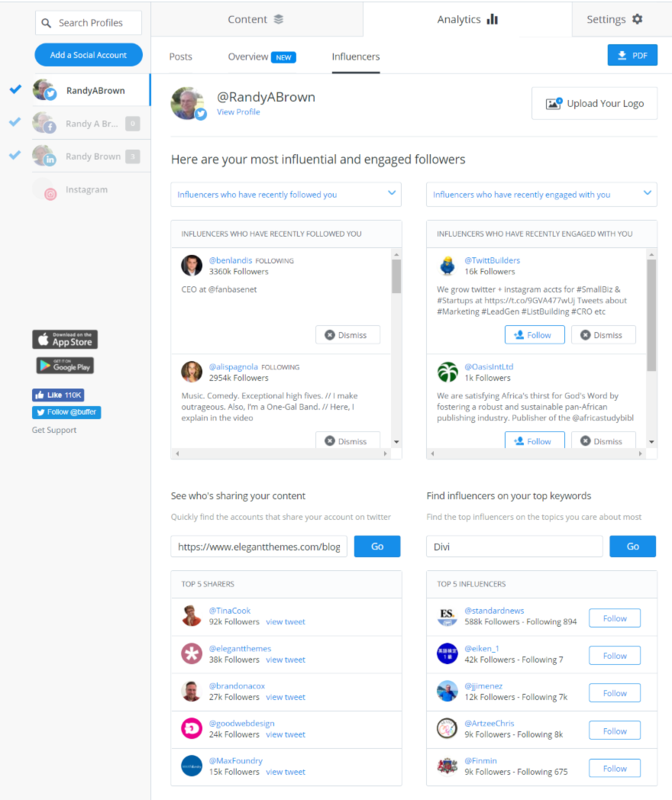 Track interactions and engagement across all your social networks. This shows you the types of content that performs the best with your audience by platform. 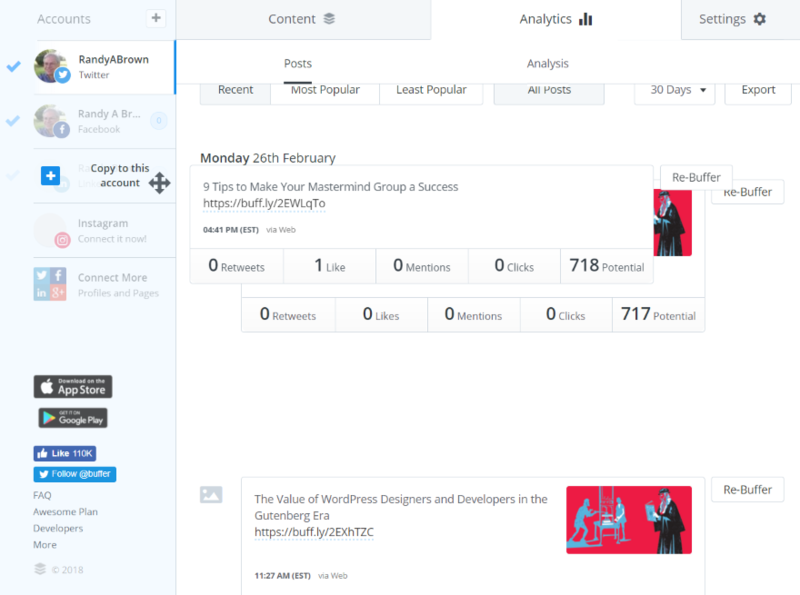 You can analyze comments, likes, shares, clicks, reach, mentions, retweets, etc. Other features include link shortening with tracking and several providers to choose from, the Pablo Image Creator for creating images for your posts, browser extension so you can save something that you see online in order to share later, post from your favorite sites’ RSS feeds, uploader for video and GIF’s, and mobile apps so you can use Buffer with Android and iOS. Let’s take a closer look at the most popular features. Once you’ve connected your social media accounts simply create your post. It shows all your accounts that the post will be shared to. It will share to all by default. Click on a social network icon in order to ignore that network for this post. When you’re ready, click Add to Queue and select Share Now. Share to as many or as few as you want. If you have a team (requires upgraded account) you can review posts in order to approve them before they go live. 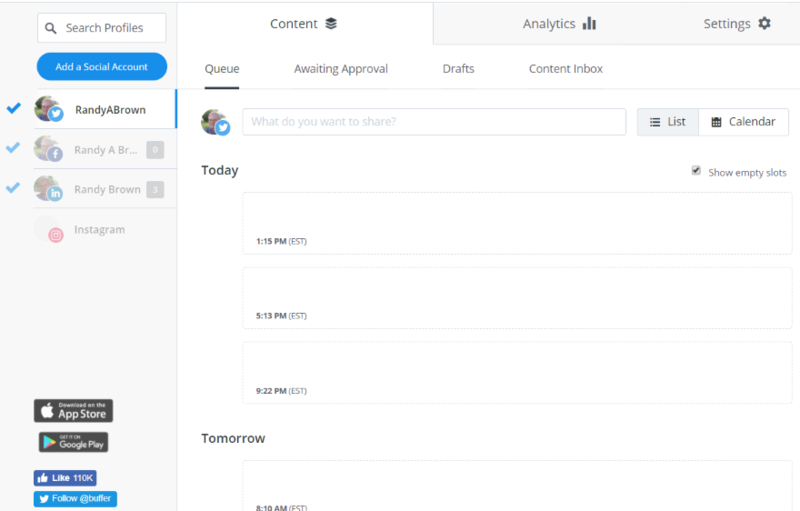 Schedule posts for all your accounts at the same time or for each account individually. This is helpful because each network has specific times that’s best to post to. Once you’ve created the post, click Add to Queue and select Schedule Post. Selecting Schedule Post (as in the image above) will open a calendar tool where you can manually select the date and time for the post to go live. Selecting Share Next will add it to the default sharing schedule. Buffer includes default times within the scheduling tool. As you add to the queue, these default times are used unless you override them. You can edit, delete, or add more posting times. The premium account allows you to see and post into each time slot. Here you can add, edit, delete, etc. Analyze the performance of each post. The free account lets you view by popularity and see retweets, likes, replies, clicks, and reach. You can also see the number of retweets, likes, replies, clicks, and potential for each post. The premium account lets you filter by number of days and export the data. It provides graphs and charts, and gives you much more detailed data to analyze for each post. 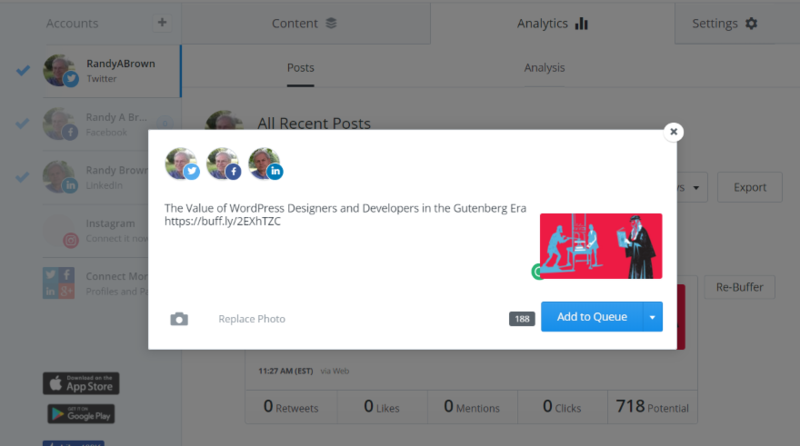 You can also re-buffer any post from the Posts screen in the Analytics tab. Clicking the Re-Buffer button opens a new field with the content already added. Here you can make edits and add it to your queue to share next, share now, or schedule. You can also choose which networks it will be shared to. To share to a specific account, you can drag the post to the profile you want to share it to. In the image above I’m dragging the second post to my LinkedIn account. The premium account also adds Influencers. This lets you see your most influential followers, those that have posted the most content, those that have engaged with you, those that follow you but you don’t follow back, etc. The premium account gives you a content inbox where you can enter the RSS feeds of your favorite websites . 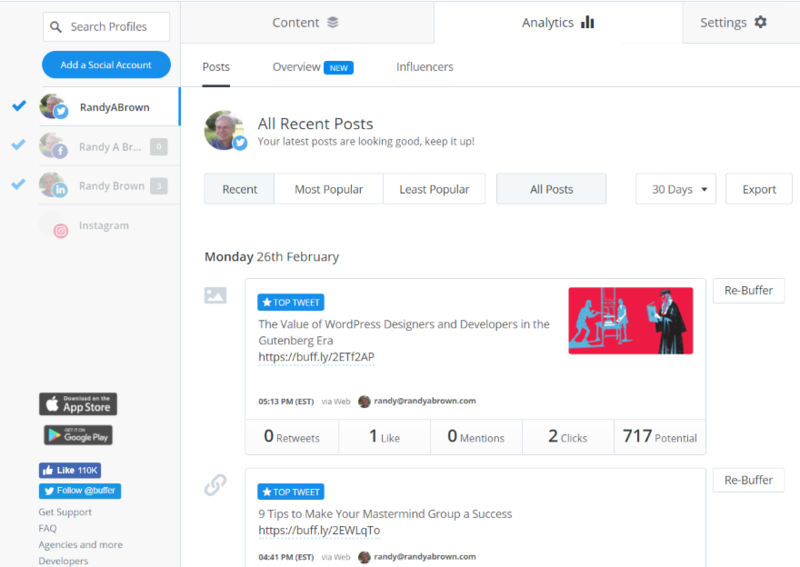 You can then see their latest posts and decide whether or not to add the posts to your Buffer to be shared on your networks. If you want to share the content simply click Add. Click Dismiss to ignore it. Posts that include an image have better performance than those that do not. 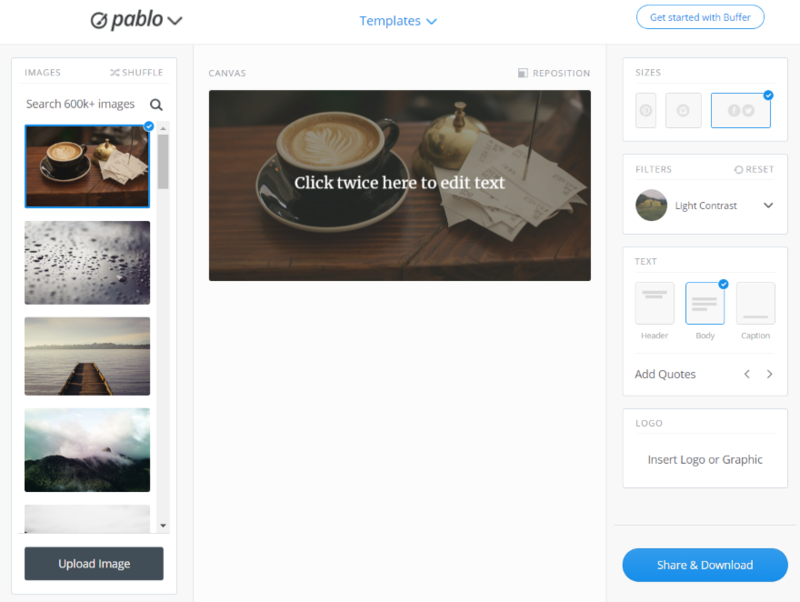 Pablo is a free image creation tool so you can create featured images for your posts. Choose from 600,000 images or upload your own, edit the text, add filters, choose the size, add your logo, add a quote, and share with your networks or download the image. Here are a few ideal use-cases where using Buffer would be an advantage. A company could have a team of associates posting to multiple social networks. Those posts could be saved as draft for approval by the social media manager. You can manage posts for your team and save time by managing multiple accounts at once, giving you a wide coverage with less effort. This means you might not need a full-time social media associate. Marketing consultants often perform social media strategy for clients as a service. Being able to handle multiple accounts from a single dashboard would simplify the task. 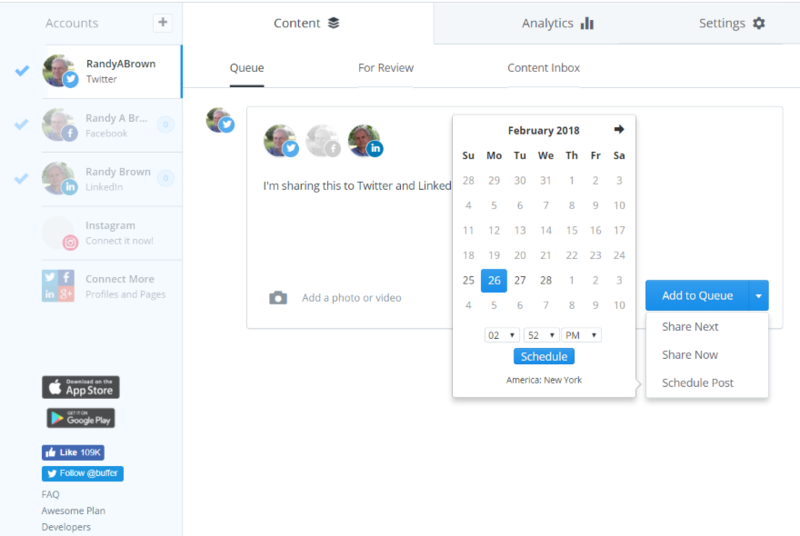 You could schedule posts for multiple clients from a single dashboard. 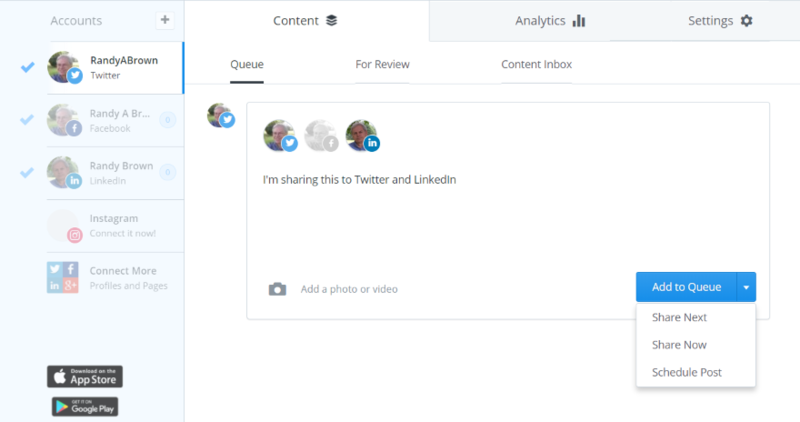 An older article by Buffer shows how Marketing Group shared content for 363 connected profiles for almost 200 individual clients. These social media profiles were handled by two people. Use analytics to monitor your campaigns so you know on which social networks to spend your advertising budget and to help you niche down and focus on specific kinds of content. This will help you to know more about your audience, which topics they’re the most interesting in, what services you should focus on, etc. This helps you to become an expert and influencer in your field and your audience will know what to expect from you. Using campaign monitoring you can make smart adjustments for better results. You can analyze based on metrics that matter the most to you and it can help you know which metrics are more important to your goals. Analyze by metrics such as the number of leads, customers, followers, traffic, reach, impressions, sign-ups, etc. Analytics will also help you to know the best times to post your content to get the most engagement from your target audience. You can then schedule your posts to go live on each network at the specific time that gets the best response. Often, in a company that is owned and operated by one person, the owner (solo-preneur) has too many roles within their company and sometimes owns multiple companies with each one needing their own marketing and social media efforts. Using Buffer would not only provide the advantages of monitoring marketing campaigns to improve content strategy, but would also save precious time so you can focus on work. Buffer is an easy platform to use. The user interface is simple and intuitive. It doesn’t overwhelm the user with features that many users wouldn’t need. Most of the features that would be beneficial to business require an upgrade, but a lot can be accomplished with the free account. 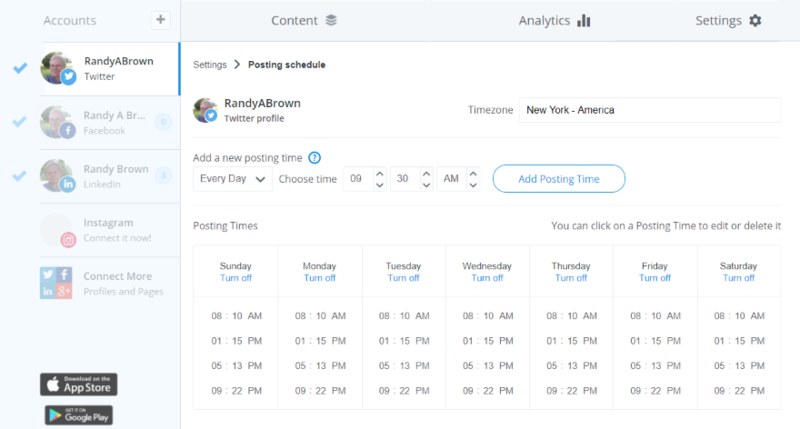 If you want a simple platform to manage multiple social media accounts and schedule your posts, Buffer is worth a look. Your turn! Do you use Buffer? Let us know about your experience in the comments! The post Buffer: A Detailed Overview and Recommended Use Cases appeared first on Elegant Themes Blog.